Over the past few months, rumors have circulated that the joint venture between Toyota and Subaru to develop an affordable, front-engine, rear-wheel-drive coupe has been delayed. ToMoCo president, Akio Toyoda, sought to address those concerns at last month's Tokyo Auto Salon, and according to Toyota's new overlord, development is still underway. Toyoda told the assembled masses that the new FR sports car is an essential part of the automaker's "rejuvenation" efforts to bring younger people into the fold, and a large part of that is price. 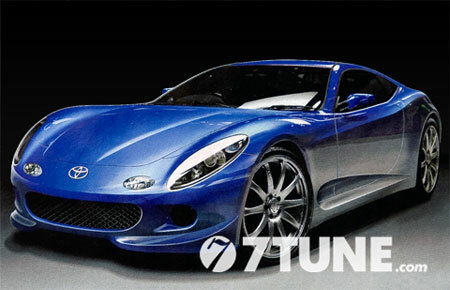 The coupe is still expected to cost around 2,000,000 yen (a little over $21,000 US) and is set to go on sale in 2012. According to Toyoda, the production postponement has nothing to do with the delay in construction of the Toyota/Subaru factory, where the two-door was due to be built next year. Instead, Toyoda claims that the hold up is due to the adaption of Toyota's new D-4S direct injection system for the flat-four engine. Currently, the FR sports car is codenamed "086A," and for those of you schooled in the world of Hachirokus, that spells good things to come. Thanks for the news man! I've been trying to keep track of Toyota's plans for sportscars for the past 4 years or so lol. I was pretty excited when they first announced this car. I hope it'll do well. I just hope they don't use the Toyota cheap materials. Our Camry is nothing but a racket after 30k. O and the rubber things around the doors is coming off, the seats are losing their color, and the gearbox is retarded. My sis's 530xi has 40k on it and is showing no signs of wear. What the hell will this look and perform like? 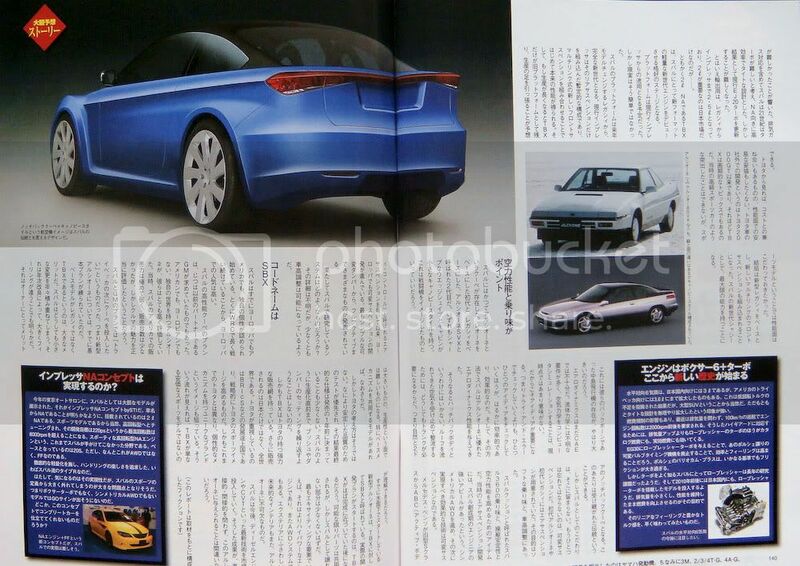 Toyota-Suburu sporty car joint venture delayed. Both Toyota and Subaru have officially confirmed that their co-developed sporty compact car project has been put on hold. The two automakers had planned a rear-wheel-drive sporty two-door based on the Subaru Impreza platform that also used Subaru’s boxer engine, but the project has apparently been delayed indefinitely due to the worldwide economic slump. Toyota gained a small stake in Subaru in 2005 and the joint project had intended to fill gaps in both automakers’ lineups. Toyota has lacked a sporty small car since the demise of the Celica and Subaru has been without a coupe for considerably longer. The small Toyota could have been badged a Scion, too. 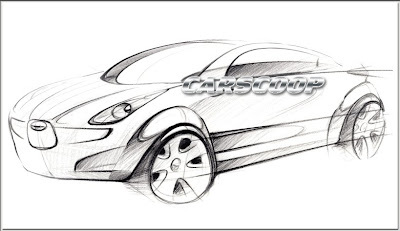 Initially, the plan had been for the sporty coupe to be on sale in 2011 or 2012, but it looks like it has been delayed at least a year, if not longer, confirming earlier reports. The plan for the Subaru to assemble Toyota Camrys in its Lafayette, Indiana, assembly plant remains on schedule, however. damn. Toyota's always conservative and safe, thats how they became the most profitable car company out there. This, then.....doesn't come as much of a shock at all. What a shame though. This will definately be an interesting car. Umm the TC is already RWD capable....why not just convert that. But it's good that they have some sense. The "Toyobaru coupe" is a subject that is near and dear to my heart. On a scale from 1 to 10, I'd give the credibility of that Left Lane story a 2. 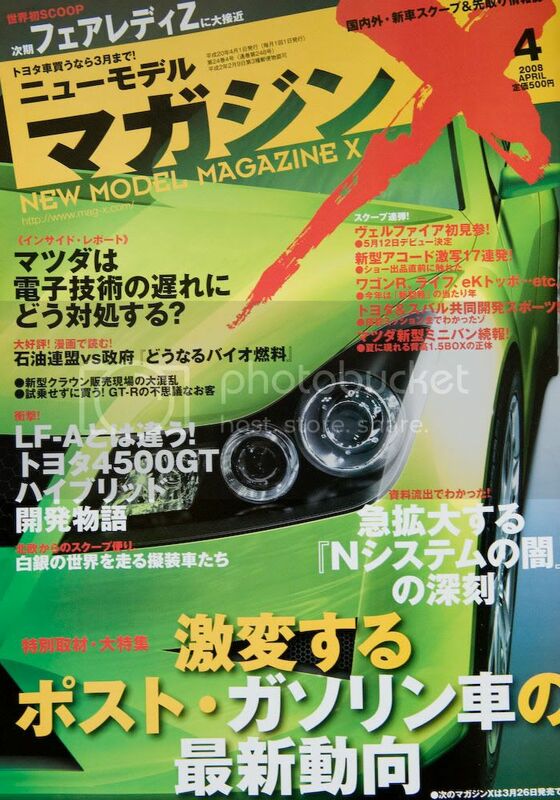 The 6 months-to-a year delay is old news, but, at this juncture, I choose to believe Akio Toyoda's purported claim at the 2009 Tokyo Auto Salon that "production will be postponed for several months so that D-4S direct injection can be applied to the flat-4 boxer engine. Production will now be postponed until March 2012" over fuzzy claims of "indefinite delays". And what's up with the last sentence, "The plan for the Subaru to assemble Toyota Camrys in its Lafayette, Indiana, assembly plant remains on schedule, however"? Camrys have been built at the Subaru plant for almost 2 years now (since March/April 2007)! What the hell will this look like? What the hell will this perform like? Most rumo(u)rs have the initial version as being rear-wheel-drive and powered by the two-liter version of the Subaru flat four, naturally aspirated but with direct injection providing 200 hp. (Although my gut tells me that North America will get the 2.5-liter version of the flat four with a similar 200ish hp output). 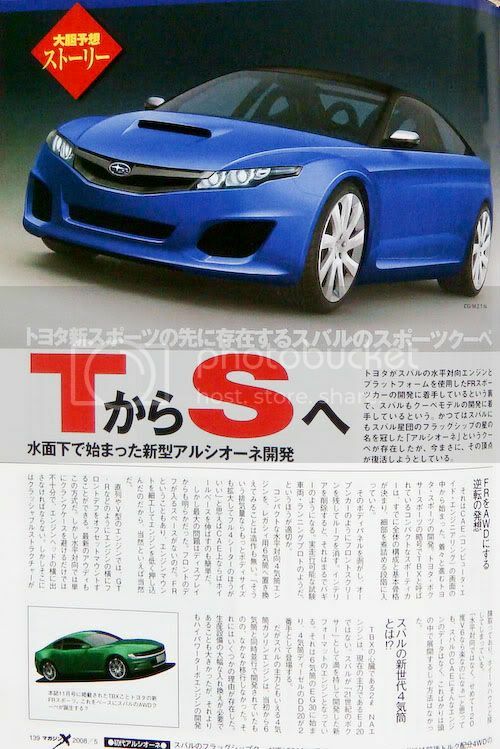 There are hopes, of course, that an AWD, 300+ hp STI version will follow. 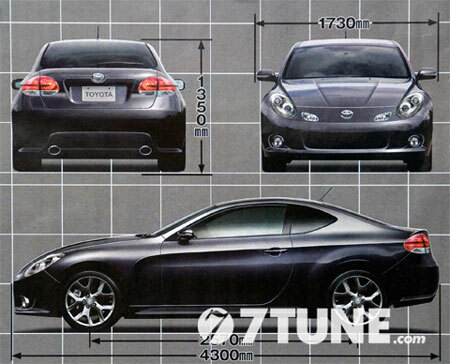 Well, the "Toyobaru coupe" could well become the next-gen Scion tC. 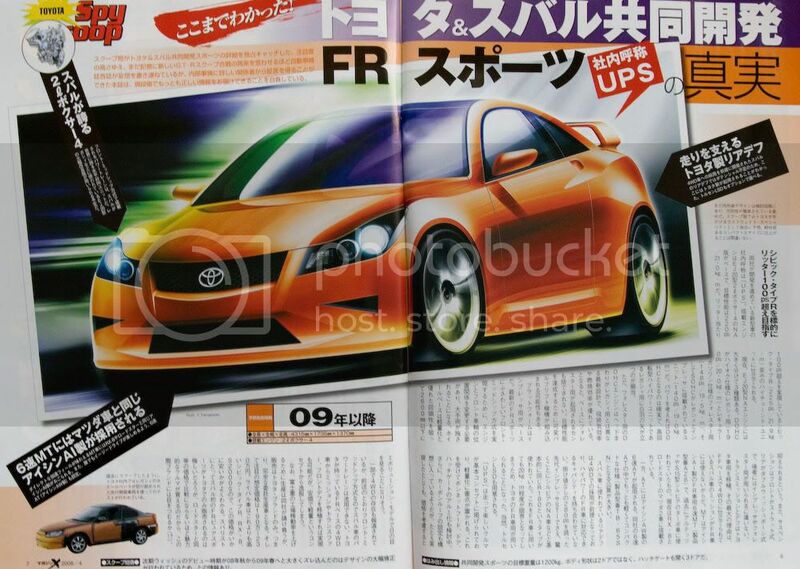 Or it could, instead, revive the Toyota Celica badge. Or it might be sold with a Toyota badge only in the Japanese Domestic Market, and sold only as a Subaru outside of Japan. All of those scenarios have been rumo(u)red. I want the Celica back.